Eyes, though simple, can be surprisingly complicated, especially if you are a perfectionist and trying to put together a set. I originally started this set for my Old Hollywood contest entry, and then decided I would like to continue with the set. (I have since continued it, with Set#2 and Set#3). My two biggest problems with Maxis eyes were that they were WAY too big in proportion to the rest of the eye and head, and secondly, there was NO shading around the sides to indicate that the eye was in fact, round. My eye set addresses both those problems. The iris is smaller, and there is shading. I also didn't like how blurry the eyes were, real eyes are VERY clear and intricate. On that note, I don't really want realistic eyes, so I didn't overdo it there. Instead, I went overboard with the colors and your new default options! All these eyes were made using the Maxis ones as a base, shrinking, and color changing them, so they still have that good-old Maxis feel to them. 15 colors in all! (See picture, I don't feel like naming them all right now). In addition I have made up a pack of Default Eyes, though, mine are different from most default eyes out there. With mine, you can pick each color individually! No more liking 3 colors but detesting the other 2! Some of the colors I'm offering are even available as two different default colors (I made some blue greens and some middle blues, those are available for both their closest matches). You will need to pick your five favorite (or you could just replace some of them, if you happen to be partial to some of the Maxis ones, or have other separated eye defaults already (like Set#2, lots of pretty greens and some hazels and purples there, or Set#3, full of browns, grays, hazels, and fantasy colors). Each Default is labeled first with the color it will replace, then with my color's name. Ex. Defaults-BrownEyes-PhaenohKeenEye-Chestnut. This file will replace the Maxis Brown eyes with my Chestnut ones. The picture below lists the name of each color and next to the name are the Maxis swatches that color could be the new default for. See the first one, 'Royal' has the Maxis dark blue swatch, meaning it could be your next Default Dark Blue if you like. Do make sure you don't just blindly drag and drop the default package into your downloads folder, they clash with each other as there are at least 3 options for each color. Please also note, the actual CAS and Bodyshop Swatch is not pictured, I made custom ones for each one so you see what color it is and that its part of this set. If you don't want to mess around with my defaults, the other package contains all the colors pictured as standard custom eyes. Each of these eye colors is binned, or genetically correct, meaning if you install my eyes they won't take over your neighborhood. 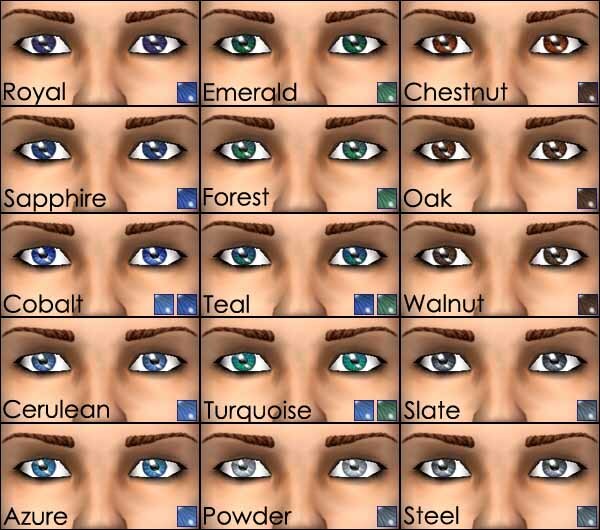 Chestnut, Oak, Walnut, Sapphire, and Emerald are set as dominant (will act like the brown Maxis eyes do) and all the others are set as recessive (act like light blue or green). 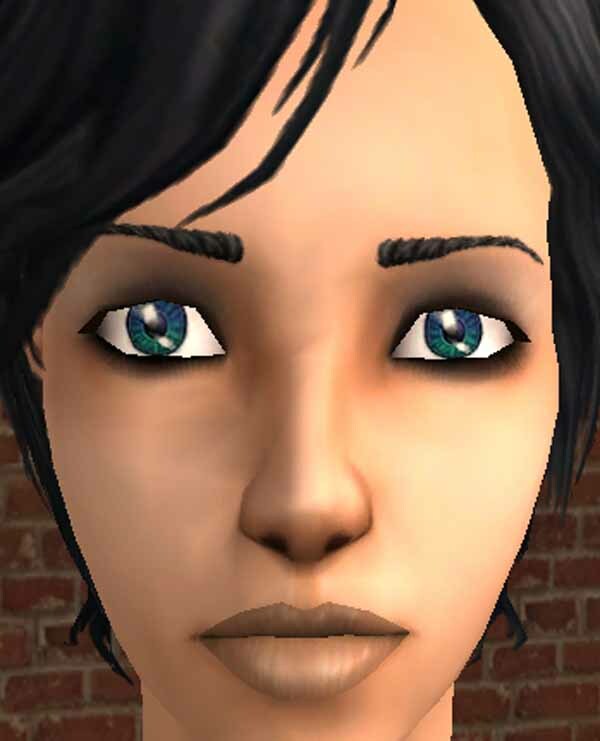 All of these eyes are townie-friendly, meaning after you install these eyes, townies created afterwards have a chance at having them, even if you don't use the default replacement set! My personal favorites are Sapphire, Emerald, Oak (hum, maybe thats how I decided what would be dominant?...) Teal, Azure, and Slate. Oh drat, that's one too many for a my Default set! Oh well, Teal really is a mixture of both green and blue, so I prolly wouldn't use that one for a default anyways. On the other hand, I really like the Pine color in the second set... What colors you pick are up to you! Have fun! P.S. I love reading comments, leave me a couple? I'd love to know which colors you guys like and which ones you'd pick for defaults! To the authors of a couple random posts on MATY and a few here that are buried so deep that you practically need spelunking gear to find them.